In 1994 Dubai Tennis Championships were taking place at The Aviation Club for the second consecutive year in a temporarily-built stadium. At that time, spectators would not exceed the few hundreds. At the end of the final match after handing out the prize to the winner, H.H. Sheikh Mohammed bin Rashid Al Maktoum announced that the following year Dubai Tennis Championships would be played in a real stadium with a capacity of 5000 people.. So in 1995 the current tennis stadium was ready to host the 3rd Dubai Tennis Championships. Acknowledging the great spaces created beneath the stadium terraces, Mr. Colm McLoughlin, Executive Vice Chairman at Dubai Duty Free, with the support of H.H. Sheikh Ahmed Bin Saeed Al Maktoum, came up with the idea of building a permanent outlet that would cater to visitors on the different events held at the stadium. The idea of The Irish Village was born. The Village was designed using Irish craftsmanship and materials which were shipped to Dubai and reassembled on site, creating an authentic experience in the heart of the city. Even the paving stones came all the way from Liscannor in County Clare, on the west coast of Ireland. All props and décor items around The Village, from the telephone box down to the shop windows bric-a-brac, are genuine Irish pieces. In the fall of 1996, The Irish Village opened its doors with a full complement of Irish staff; a tradition that has been kept to the current days! 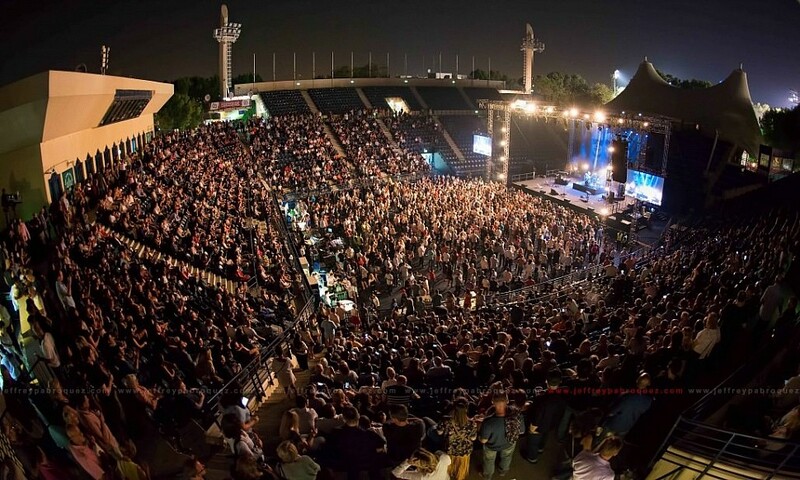 With the ongoing success and the increasing demand, The Village terrace has been expanded over the years to satisfy Dubai patrons and can now accommodate up to 3500 people during special events and concerts. Famous performers have played at The Village: Sir Bob Geldof, Finbar Fury, The Human League, The Pretenders, Paolo Nutini, Macy Gray, The Wailers and Midge Ure to name just a few. Over the years, The Irish Village has celebrated its birthday with big parties and concerts featuring popular Irish bands. To commemorate the 10th anniversary in 2007, a life-size bronze sculpture of three traditional Irish musicians, depicting the rural charm of the Emerald Isle has been installed in the center of The Village terrace. The sculpture, entitled “The Session” was commissioned In Ireland and created by Irish artist Austin McQuinn. It was then shipped to Dubai and unveiled in the presence of An Taoiseach Bertie Ahern, Ireland prime minister, to grace The Irish Village terrace.